Born in the U.S. and raised in Quito, the capital city of Ecuador (South America), I grew up in a bicultural, bilingual family (English and Spanish). From my primary and secondary education at the German School in Quito, this naturally became my third language, with French added to the repertoire as part of my college major in Foreign Languages. Portuguese would come later, picked up within the work context. After an initial career in administration, I eventually set up my own business, and for sixteen years pursued a successful career as a free-lance professional translator and conference interpreter. My love of quilting, however, slowly started to take over more and more of my time, until I finally decided to take the plunge and in 2003 set up a new business. 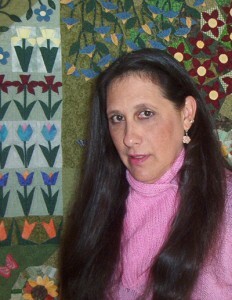 I now work full-time as quiltmaker, designer, and teacher. I currently live in Quito, Ecuador. I am a single parent to three grown-up children, two of which also happen to be my housemates. The oldest one (Jonathan, recently divorced, runs his own small business), has given me the wonderful blessing of a granddaughter and grandson you will often see me blog about. Jared is my business partner and your tech support, both here and for our website. And Jamie is a college student (education major, and my other human housemate), still doing her best to finish raising me. You will also find me often blogging about my mother – or Oma as she is known in the family. She is pretty much the head of this family, provider of much support and many, many wonderful meals. This is my personal blog. So what I share with you here is truly personal: about my family, my friends, life in Ecuador, my interests… and especially about my own passion for quilting and my learning experiences. Because I have been blessed with being able to travel extensively and meet people from all walks of life, being part of an international community is REALLY important to me. And so, I am really happy to have you visit my little corner of the world, and hope you will share about yourself and your life. And don’t forget to leave your contact information so I can get to know you, too!